Give customers a clear view of their transactions and share dynamic content at the point-of-sale with this 7-inch diagonal LCD display. Integrates easily into your retail solution adding video content and graphics to improve the customer experience. 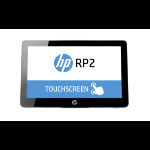 - Simply connect the head-only display to an HP L6015tm or L6017tm display, or HP RP71 through the USB bezel connector that powers the CFD and eliminates the need for additional cabling. - Place the durable display in a range of high-traffic areas. The edge-to-edge, bezel-less design is easy to clean, providing protection from dust and creating a sleek, modern appearance. International delivery to over 56 countries Delivery to most major countries take no longer than 1-4 business days. Delivery is charged based on total weight and volumetric weight of the ordered items.